Apricots are here and I’m so happy. As I’ve said before, my baking style definitely favors a more relaxed during the spring and summer months. 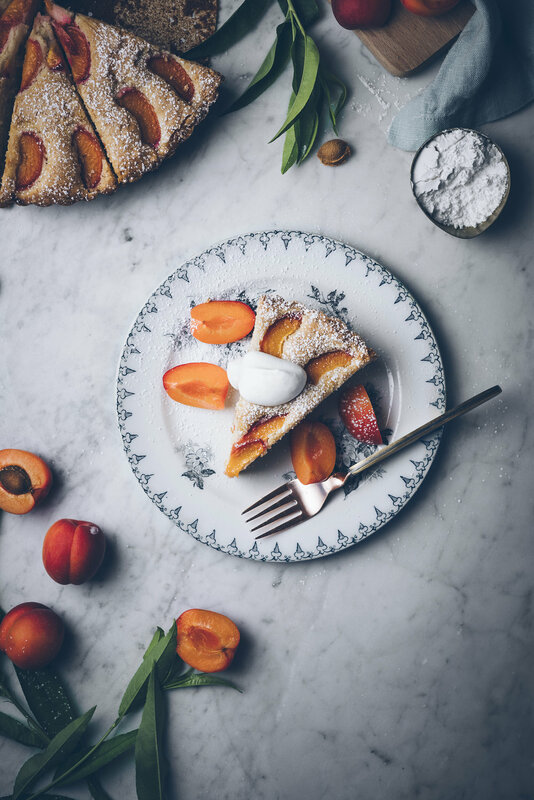 I love simple recipes with ingredients at the peak of their season, and these apricots in this straightforward cake are certainly no exception. The recipe comes from Melissa Coleman’s new book, The Minimalist Kitchen, and it’s perfect for this time of year. Melissa's original recipe included toasted almonds ground up and added to the cake, but as much as I love almonds, this cake was going to enjoyed by those who have nut allergies so I made a few changes. In place of the almonds I used some spelt flour, which worked out quite perfectly. Remember, this cake is incredibly simple to make. 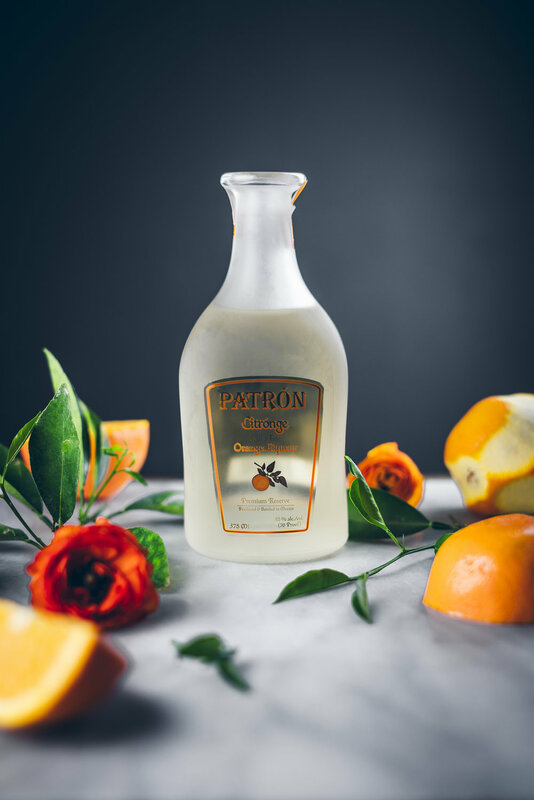 And the combination of fresh apricots and buttery cake come together in the most beautiful way—one entirely appropriate for celebrating the arrival of apricots. Heat the oven to 350°F. Place a 10-inch removable bottom tart pan on a baking sheet. Set aside. Whisk together both flours, baking powder, and salt in a medium bowl. Set aside. Place the butter and sugar in the bowl of a standing mixer fitted with the paddle attachment and beat on low for about 5 minutes. Add the eggs and vanilla and increase speed to medium. Mix until everything is evenly combined. While the mixer is on low alternate adding the milk and the flour in three increments, mixing until just combined. Stop the mixer and use a spatula to scrape down the sides, and folding any unmixed parts into the batter until incorporated. Pour the batter into the prepared pan. Smooth out the top with a spatula and place the sliced apricots in desired fashion on top, barely pressing into the cake. Bake the cake for 50 min to 1 hour or until cooked through. If the edges brown too quickly (wasn't a problem for me) simple tent a piece of foil over the top of the cake and continue baking. Place the cake on a cooling rack for about 1 hr before removing from the tart pan. Dust the cake with powdered sugar, slice, and serve. Melissa notes this cake is best served within 2 days of making. Store lightly covered at room temperature. A good banana cake is truly a wonderful thing, isn't it? And this particular kind of cake is great because it requires a bit of patience—which only makes each bite all the more satisfying in the end. The key to a moist cake like this is to use really ripe bananas, which always seem to be in abundance around the house when I don't need them but totally absent whenever I do! This cake is truly a classic, and Ina Garten's original recipe is wonderful. I made some tweaks to her approach mainly due to what I had on hand, but also because I usually like to reduce the amount of sugar while baking to let the natural flavors of the craft shine through a bit more. This cake is seriously moist, and is complemented by the dreamiest cardamom frosting. Each bite introduces a wonderful rush of flavor, from the banana to the cardamom—every forkful is pure bliss. So for those of you craving a banana cake soon, hang on to some bananas until they ripen and follow the guide below. Heat oven to 350F. Lightly grease and flour an 8 x 2-inch round cake pan. In a medium bowl whisk together the flour, baking soda, and salt until well combined. Set aside. In the bowl of an electric mixer fitted with the paddle attachment, mix the bananas, granulated sugar, and brown sugar on low speed until combined. While the mixer is still on low, add the oil, eggs, plain yogurt, and vanilla and mix until combined. While the mixer is on low, add the dry ingredients and mix until just combined. Remove the bowl from the mixer base and fold in the walnuts with a spatula. 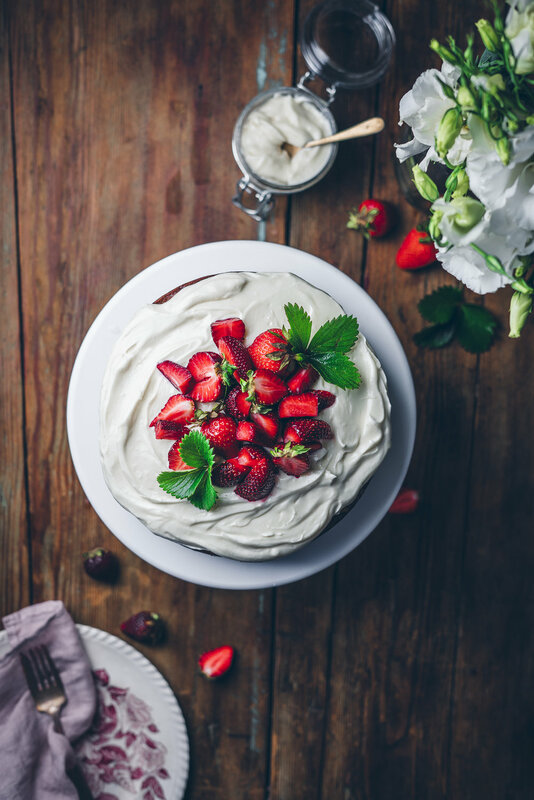 Pour the batter into the prepared cake pan and bake for 45-50 minutes, or until the cake has browned and a toothpick inserted into the center of the cake comes out clean. Allow the cake to cool in the pan for 15 minutes, then turn out onto a cooling rack to cool completely. 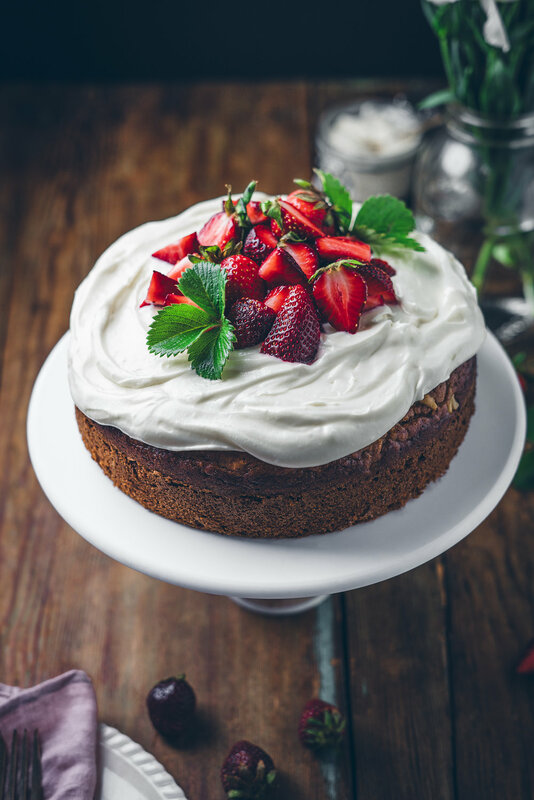 Once the cake has cooled, spread the frosting over the top and garnish with fresh strawberries and enjoy! Place the milk and the crushed cardamom pods into a small saucepan and set over medium heat. Once the milk is just beginning to simmer, immediately remove from heat, cover with a lid, and let everything steep for 30 minutes. Place the cream in a container and store into the fridge until cool. Mix the cream cheese in the bowl of a standing mixer and beat on medium speed with the whisk attachment until smooth. Add the powdered sugar, salt, and vanilla and continue to whisk until incorporated. Once combined, increase the speed slightly and add the chilled cardamom infused cream. Beat until the frosting is light and fluffy. Spring rolls are in a sense a quintessential spring meal—they were first created as a showcase for the fresh, bright ingredients of spring that follow the rich, heavy dishes of winter. And boy do they live up to their name. They’re vibrant, colorful, crispy, and delicious in all their forms. And for my latest batch, I decided to mix sweet and savory aspects into my rolls and pair them with a spicy peanut sauce. Starting off with a some delicate vermicelli noodles and a soft, classic wrap, it’s hard to go wrong in assembling a spring roll. For the savory side, I chose cucumber, carrots, and cabbage for their complementing flavors and crunchy texture. And for the sweet side, I packed in some pineapple for a piercing juiciness. I also tossed in some fresh herbs, mint and cilantro in particular, to tie everything together with their refreshing aromas. The peanut sauce is relatively straightforward: peanut butter (obviously), soy sauce, vinegar, with some garlic and sriracha for some bite to go along side the tangy nuttiness. Feel free increase or reduce the amount of sriracha depending on your taste, and in fact you can treat the whole roll assembly as a blueprint for whatever happens to be your favorite spring vegetables, fruits, and herbs. After having put together a sweet seasonal meal out of these spring rolls, I needed a wine appropriate for this time of year. And trust me—look for further than La Crema’s Monterey Pinot Noir Rosé. 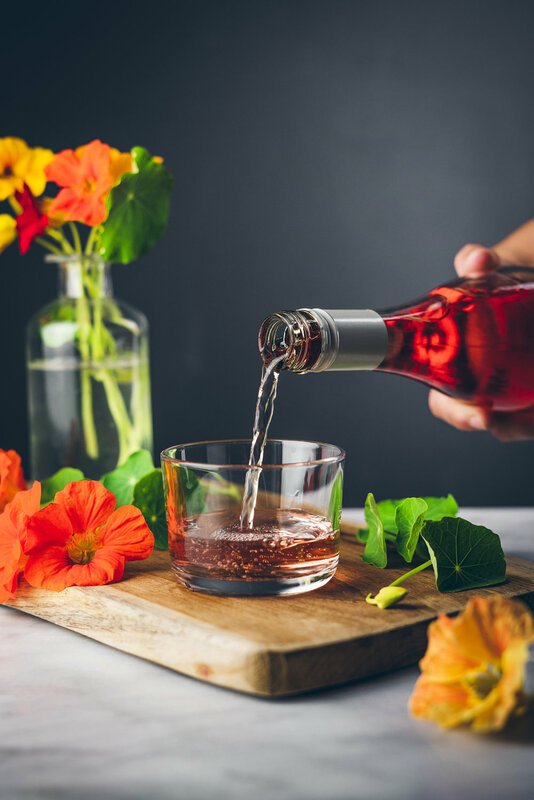 Unlike most rosés, which tend to be on the lighter side, this wine is surprisingly rich and dynamic. 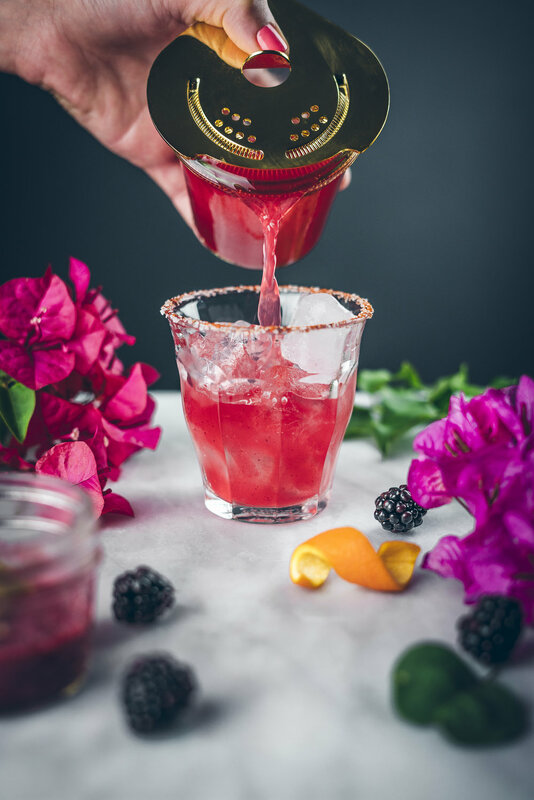 It begins with bursts of berry and melon, moving into sweet, bright citrus. It’s wonderful on its own and even better when paired with this recipe. 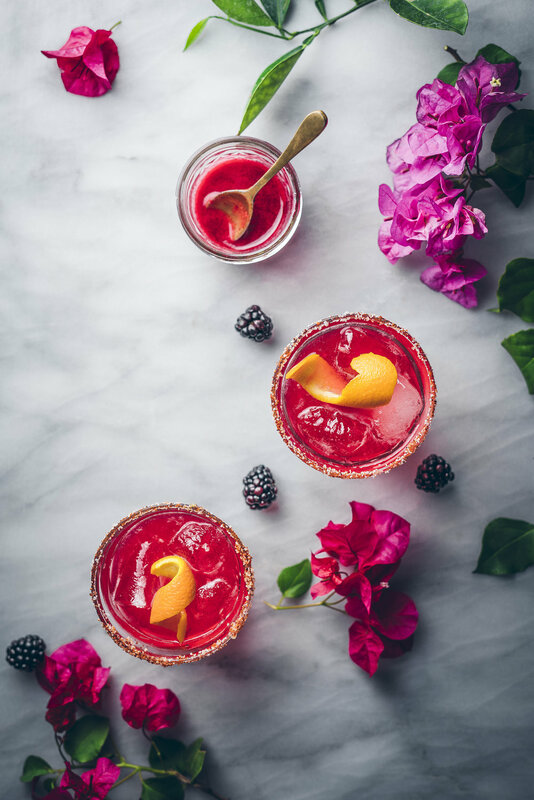 Be sure to head over to La Crema’s blog to get the recipe, and enjoy it on your next sunny spring afternoon! And while doughnuts themselves are quite the treat, making them certainly isn’t. Thankfully, however, there’s a few options–and one among them makes the process absurdly easy. Baking doughnuts turns it into a whole new affair. Prep time’s 15 minutes, bake time’s another 15, and there you have it–fresh treats ready in a pinch. They admittedly take on a different texture than yeasted or fried doughnuts (in fact it’s something like a doughnut-shaped cake), but it’s nevertheless expectedly pleasant. I decided to make mine with some almond oil for a subtle yet present nutty flavor, and to dress them in a blueberry glaze–which is amazing. So basically, if you want fresh, homemade doughnuts roughly half an hour from now, go scoop up a doughnut pan and follow the recipe below! Whisk the flour, sugar, baking powder, salt, and cinnamon together in a medium bowl; set aside. In a separate bowl, whisk the eggs, oil and yogurt together until combined. Pour the wet mixture into the dry ingredient and mix together with a spatula until just combined. Spray the doughnut pan with some non-stick spray, or grease with some room temperature butter. If you skip this step, the doughnuts will likely stick even if the pan is non-stick. Fill each doughnut mold half full with batter. The easiest way to do this is to fill a pastry bag or a zip lock bag with the batter, snip of the tip (or one corner of the ziplock) and start filling. Place the pan in the oven and bake the doughnuts for about 10-12 minutes. The doughnuts are done when slightly browned, and if they spring back to the touch. Remove the doughnuts from the oven and use a spoon to carefully remove them from the pan. Place the doughnuts on a rack and allow them to cool completely before frosting. Place the blueberries, water, lemon juice, and salt in the saucepan. With the back of the a spoon, smash the berries, then place the saucepan over medium low heat. Cook the berries for about 2 minutes, while continuously smashing them, them remove from heat. Strain the mixture through a fine mesh sieve. Add 2 tbs of the blueberry mixture to a shallow bowl (should be about all of the juice) along with the vanilla extract and the powdered sugar. Mix everything together until smooth. If the mixture seems too thick, add a tiny splash of milk. Alternatively, if the mixture is to wet, add a little more powdered sugar. Use glaze right away and garnish and top with sprinkles. Mix everything together in a small bowl until smooth. If the mixture seems too thick, add a tiny splash of milk. Alternatively, if the mixture is to wet, add a little more powdered sugar. 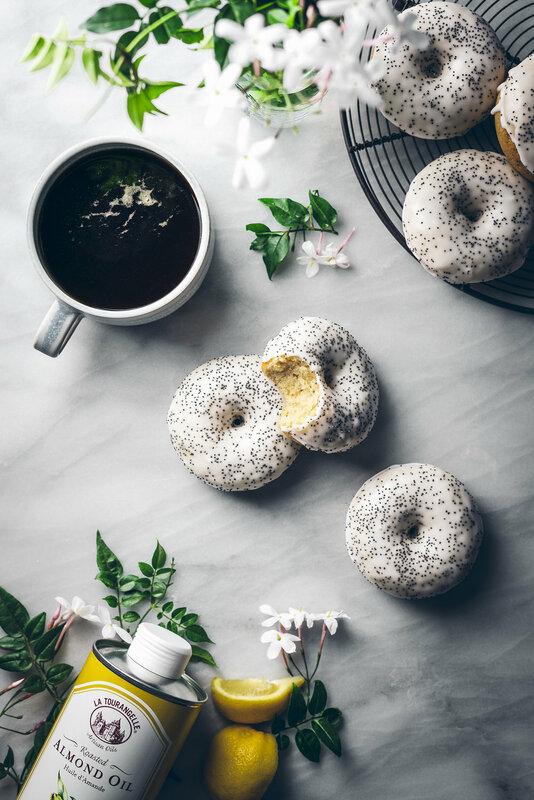 Use glaze right away and garnish with poppy seeds. Now that the days are longer (thank you Daylight Saving), that means St. Patty’s day is just around the corner (meaning tomorrow) and all things green and beer-flavored shall be consumed. This particular holiday isn’t a very big deal in my household, but as a lover of beer, getting the chance to add a little to my baking is quite fine by me. 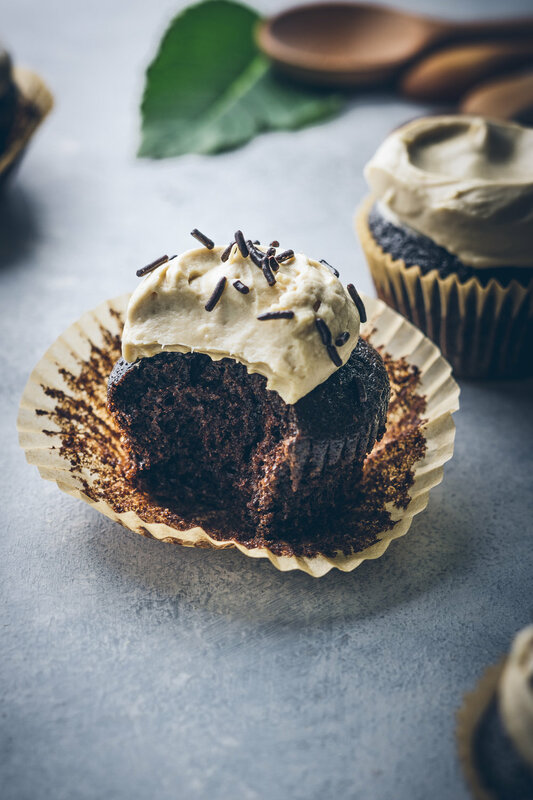 These moist, chocolatey cupcakes are laced with espresso powder—from the cake to the frosting. They’re sweet, but not too sweet, and loaded with a perfect amount of Guinness and chocolate of which my Irish ancestors would be proud. So for those of you looking for an easy recipe to help you celebrate St. Patty’s day tomorrow, I promise that these are the cupcakes for you. Here’s a little video to prove how easy they are to make! Heat oven to 350°F and line a 12 cup muffin tin with cupcake wrappers. Add the flour, baking soda, cocoa powder, salt, and espresso powder to a medium bowl and whisk to combine; set aside. In a large bowl add the yogurt, oil, egg, vanilla, and beer, and whisk together until smooth. In two additions, whisk the flour mixture into the wet until smooth with no lumps remaining. Divide the batter evenly between the cupcake molds and bake for 18-20 minutes, or until a tester inserted into the center of the cupcake comes out clean. Allow the cupcakes to cool for 3-5 minutes then transfer to a cooling rack to cool completely. While the cupcakes are cooling prepare the frosting. Once the cupcakes have cooled, transfer the frosting to a piping bag fitted with you tip of choice and frost each cupcake. Depending on how much frosting you like on your cupcake, you may have a little left over, which isn’t too bad of a problem to have, is it? Place the cream cheese in the bowl of a standing mixer fitted with a whisk attachment. Whip cream cheese until fluffy, about 1-2 minutes on medium speed. With machine off, add 1 1/4 cup of sifted powdered sugar, the vanilla, butter, 2 teaspoons of instant espresso powder, and a pinch of salt. Whisk everything together until combined, making sure to scrape down the sides of the bowl as needed. While mixer is still on at medium speed, slowly pour in the heavy cream in a steady stream. Once all of the heavy cream has been added, continue to whip the frosting until stiff peaks form. Great sandwiches have become one of my staples as of late. They’re easy to make, hard not to love, and surprisingly versatile. And while corned beef usually isn’t my first choice, I thought I’d take a crack at making a great sandwich out of it since St. Patrick’s Day is coming up soon. 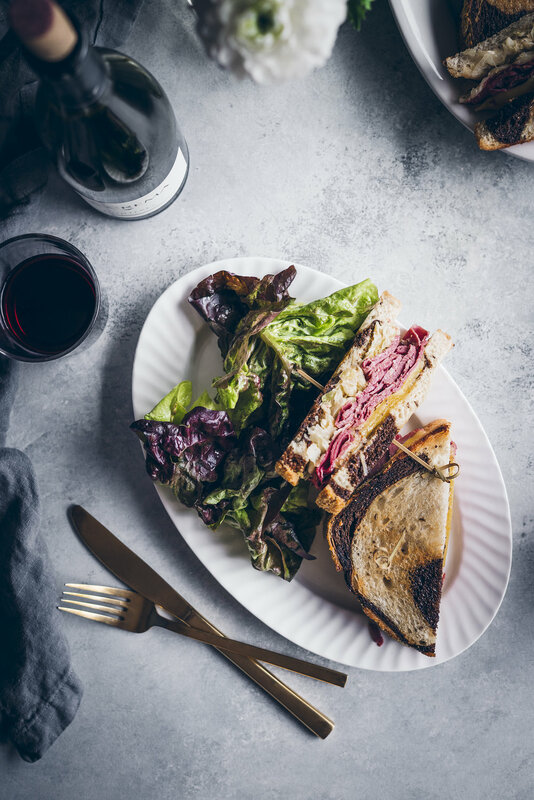 My plan was to make a fresh version of the classic reuben—corned beef of course, with sauteed cabbage and onions, sauerkraut, mustard mayo, sharp cheddar, and marbled rye. Thankfully, it all came together very well. It’s a powerhouse of briny, sour goodness, with enough sweetness from the onions and cabbage to cut through for some balance. Add the earthy rye and the tangy mustard mayo and this dish is completely delicious. The briny, sour vibes of this sandwich led to find me a pleasantly unexpected partner in La Crema’s 2015 Monterey Pinot Noir. Its tangy dark fruit and citrus notes come alongside its peppery spice to fit right in with the corned beef and sauerkraut. The two come together quite well, and the result is delightful. Head over to La Crema’s blog now to get the recipe! I can’t believe I am saying this, but John and I are officially Californians again! Seattle was our home for over 6 years, so while it’s a little weird not to be there anymore, I will say that it feels great to be back in the state where we both grew up. It’s so nice being near family. That was seriously one of the hardest things for me when living in Seattle—missing birthdays, holidays, and other important events was the worst. But now that we are back, I get to reconnect with friends, spend more time with family, and bask in that glorious California sun. Since we’ve moved, I haven’t let a single week go by without consuming a load of fresh, bright citrus. Every market I’ve gone to has the most impressive selection of fruit. 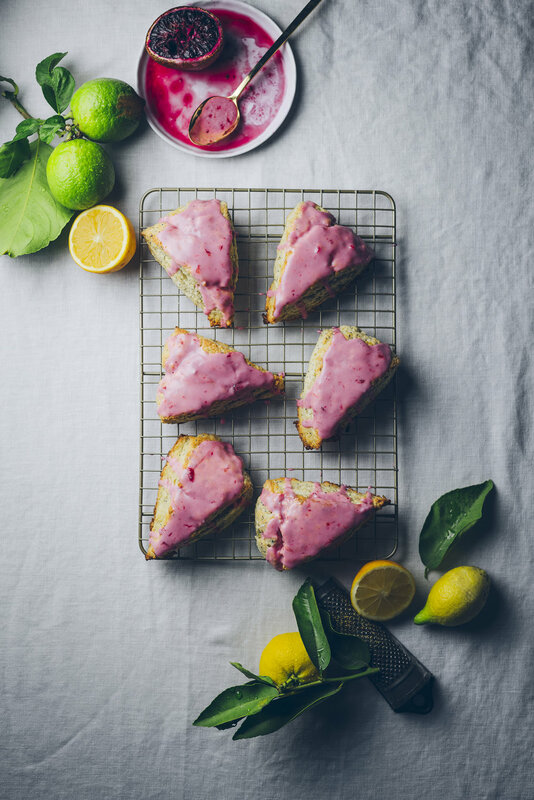 I have even found varieties that I have never seen like finger limes (which are crazy cute) and cocktail grapefruits (which taste like a sweet lime crossed with grapefruit) I’m loving all this citrus so much that I’ve baked these meyer lemon and ricotta scones three times already. It all started with some inspiration from The Smitten Kitchen, which I then adapted into this citrus-forward recipe. I made a batch to snack with my morning coffee, another for a party we went to, another for a weekend brunch gathering. Try out the recipe below—you won’t regret it. Heat oven to 425F. Line a large baking sheet with a piece of parchment paper and set aside. To a large bowl, add the sugar and lemon zest and rub the zest into the sugar with your fingers for a minute or so, or until the sugar has turned slightly yellow and has become fragrant. Add the flour, baking powder, salt, and poppy seeds to the bowl and whisk to combine. In a medium bowl add the heavy cream, ricotta, and vanilla extract, and mix until smooth. Add the cubed butter to the bowl with the flour mixture and with your fingers rub the butter into the mixture until the butter forms into pea-sized clumps (you could use a pastry cutter). Add ricotta mixture to the flour mixture and mix until you form a shaggy dough. Dump the dough onto a lightly floured surface and gently knead together into a disc roughly 7 inches wide. Cut into 8 equal sized pieces and place onto prepared baking sheet. Bake for 15 minutes or until lightly browned and cooked through. Cool for a minute or two in the pan then transfer to cooling rack. Once cooled, start making the glaze. To make the glaze, mix powdered sugar and blood orange juice together until smooth. 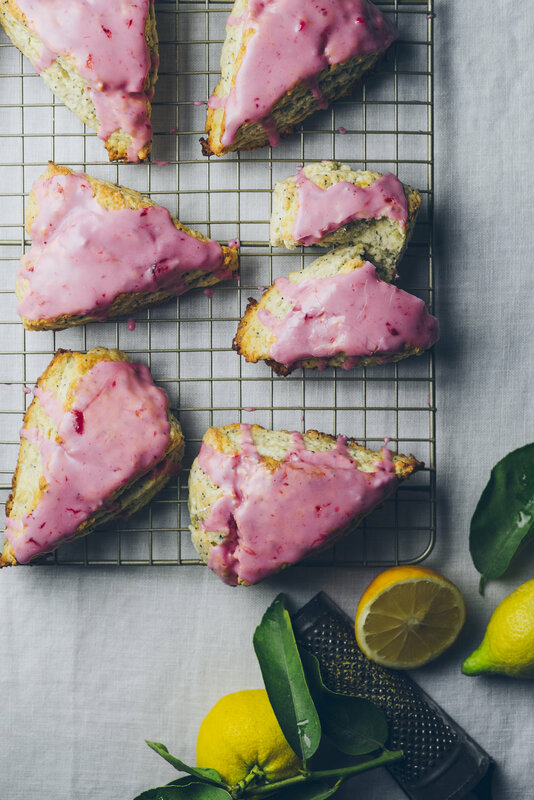 Drizzle over scones and enjoy. Just a quick note, the glaze yields just enough to cover all 8 scones, so try to be judicious when it comes to this part. Each year growing up, my mother would take me and my sister to her little hometown deep in Mexico. To be immersed in the culture, land, and history of my heritage was always so special, and it was during those trips that my love for travel and culture began growing. It's no wonder then, that when John and I were presented with the chance to visit this lovely country last month we jumped at the opportunity. This time the destination wasn’t a tiny obscure town in the middle of nowhere, but beautiful, bustling, coastal Cancun. And although enjoying the impossibly gorgeous beaches and indulging in authentic Mexican dishes was so much fun, speaking Spanish again was really the best. Diving back into this language brought forth a flood of precious memories from past trips with my mother that made the overall experience that much better. Now though I in particular have many memories tied to Mexico because of my past, it’s actually a pretty magical place to make memories for any one—Cancun especially. John and I first visited Cancun several years ago, and visions of electric turquoise waves, deep inviting cenotes, and towering ancient ruins are still fresh in our minds. But best of all, we remember standing at the edge of the water at sunset on a lone dock with glasses of champagne in hand, renewing our vows to one another on the day of our first anniversary. 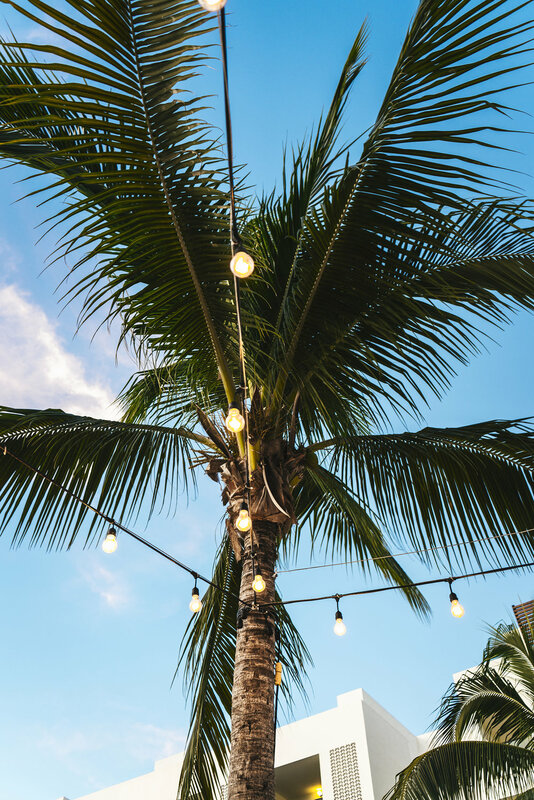 And that’s what Cancun is capable of—it’s romantic, serene, breath-taking, and one of the best places in the world to make memories like that. For our latest trip to this seaside gem, we stayed at the wonderful Finest Resort and basked each day in sun rays we thought didn’t exist anymore (for most of each year in Seattle, the sun transforms into a mere myth). We stayed in a comfortable room with its own pool out back, a jacuzzi, and a comfy hammock to swing in. The whole place was just what John and I needed to have a relaxing and comfortable trip. We certainly took our time to rest, but we also made sure to get out and visit ancient sites, Mayan temples, and coastal towns. So if any of you are visiting Cancun soon, I've included some tips below to help make the most of out your trip. Second, get out of the resort. 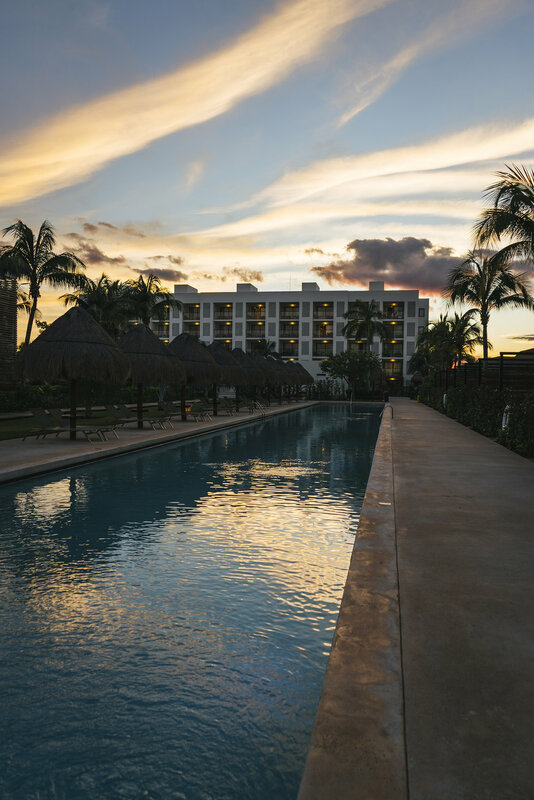 Don't get me wrong, staying at the resort is a wonderful thing, but there is so much more to see and experience beyond the walls of your hotel. I highly recommend Chichen Itza and Tulum—two ancient sites beautifully preserved from a thousand years ago. Heading to either of these spots will include a lengthy drive, but it is totally worth it. Also, if you do make it out to Tulum, I suggest stopping in the nearby city of Playa Del Carmen. It is a cute beachside town that is perfect for shopping, walking around, or for enjoying some authentic Mexican food. Third, make sure to try some authentic Mexican food. 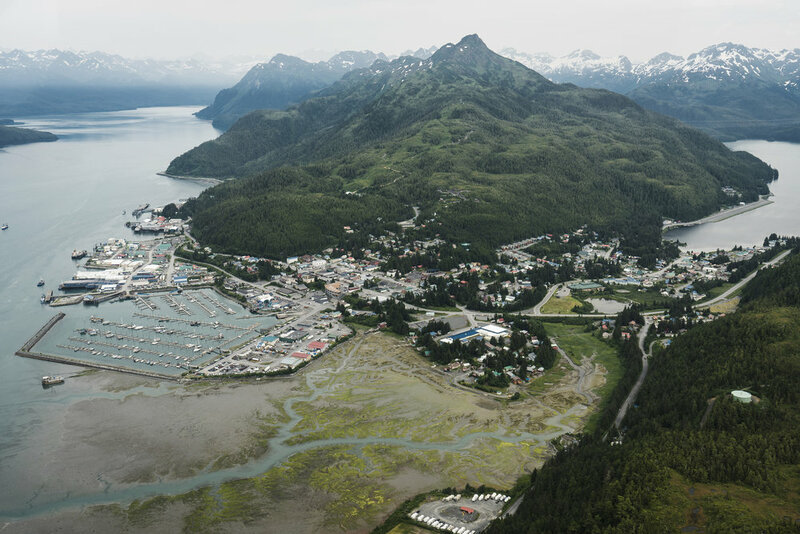 Take some time out of your resort to drive along the coast and visit big cities and small towns. And don’t avoid the hole-in-the-wall restaurants—they’re likely the best around. And Lastly, bring A LOT of bug spray. Seems like a small tip, but the difference between having this on hand and not is the difference between a good vacation and bad one. Keep the mosquitos away and enjoy yourself! Here are a few other food spots that we we didn't get a chance to check out. Many thanks to Alaska Air for sending John and I on this incredible trip. This was a sponsored post and as always, all opinions are my own. It’s officially that time of the year where the Seattle grey has taken over, and I am fully embracing it. It’s so funny–it’s always right around this time of year that I feel as if I never turn my oven off, which I admit isn't too bad of problem since my house usually smells like cinnamon, sugar, and butter. But since my oven is getting over worked, I have been slowly noticing that it’s performance has been so-so lately, mostly due to it not being properly calibrated. Not a big deal, but I just have to either keep a thermometer in it, or keep a close eye on what I am baking. Well, until now, that is. The lovely people at Wolf Gourmet recently sent me their Countertop Oven–and I am in heaven! This small oven is a total dream. It has multiple settings so you can roast, bake, broil, and even proof dough inside this bad boy. Plus it even has a convection setting, which for a girl like me is a dream to have. Since pears are in total abundance at the markets, I recently made these cardamon-spiced turnovers, which are super tasty and incredibly addicting. And with my countertop oven, I effortlessly produced evenly browned, beautifully puffed turnovers. 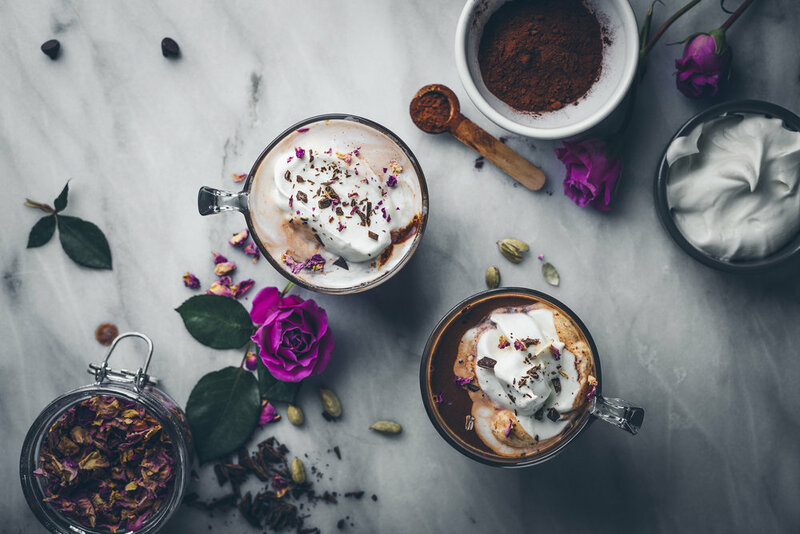 If you’d like to get the recipe for these wintry treats, head over to the Wolf Gourmet blog! Thank you for supporting the brands the help The Broken Bread thrive. This is a sponsored post. As always, all opinions are my own. A few years ago I made my first batch crinkle cookies–soft, delightful treats with fissures on top like mudcracks in the ground of a desert landscape. And since they’re perfectly dense, chewy, soft, and textured, they’re basically the best of all possible cookies. That’s why I was so surprised this past week to discover that it had been years since I’d made any, and I set out to refresh the recipe for the holidays. After making a fresh batch of these crinkle cookies, this time incorporating chunks of chocolate that burst and melt away with every bite as well as some peppermint extract that makes every one of those bites refreshing, I’d say we have a new holiday tradition on our hands. They’re so dense and chewy that they’re almost slipping off the edge into brownie territory. And the indulgent chocolate cooled by the breeze of mint makes it seem like every chilled Junior Mint at the movies growing up was but the shadow of this cookie’s triumph. Seriously, these cookies take mere minutes to put together, they’re super low maintenance, and yet after 10 minutes in the oven you’ll be presented with some of the most impressive treats you’ll have had all year. Follow the recipe below and happy holiday cookie baking! In a medium bowl, sift together the cocoa powder, flour, baking powder, and sea salt then set aside. In either a medium bowl, or in the bowl of a standing mixer, add the vegetable oil and sugar and mix for about 30 seconds, or until it looks like wet sand. Beat in the eggs one at a time, then mix in the vanilla and peppermint extract. Add the flour mixture and beat on low (or mix by hand) until the dough just comes together. Add the chopped chocolate and mix a few more times to combine. Cover the dough tightly with plastic wrap and place in the refrigerator for at least four hours. Heat oven to 350°F and line a cookie sheet with a piece of parchment paper. Roll the dough into 1oz balls, if you don’t have a scale, I would suggest using a slightly heaped tablespoon-sized portion of dough. Place the powdered sugar in a small bowl and roll each ball in the sugar to coat. Place the coated balls on the cookie sheet and bake for 10-11 minutes. Remove from the oven and let stand on the cookie sheet for 2-3 minutes before transferring to a wire rack to cool completely. Repeat this process until all cookies have been baked and enjoy! When I began travelling after high school, it was the first time I ever took photography seriously. I had a clunky Canon 35mm camera loaded with black and white film that I took around the country and the world alike, and I had the time of my life shooting everything from European cathedrals to iconic East Coast skylines. There was something about capturing special moments during my exploration of new cultures and terrains that I found irresistible, and the decision to keep finding new things to shoot once I got home was completely natural. And now, John and I have just returned from a truly wonderful trip to Greece, Israel, and Italy where my love for photography was dramatically refreshed. We started the trip in Athens, Paros, and Santorini, followed by more of Greece along with Israel and Italy with Viking Cruises, and then we finished on our own again in Rome and the Amalfi Coast. It was a journey filled with intense history, amazing cuisine, and, of course, extremely beautiful sites. One thing that set this trip apart from others was the cruise with Viking—the first cruise we’ve ever been on. We weren’t sure what to expect, but it was honestly fantastic. Waking up each morning in a totally new land to explore was a constant thrill, enhanced by stellar service and great food. The ship itself is modern and elegant, with a tasteful mid-century design all throughout the interior that makes any part of the ship a beautiful place to relax. There were a couple of days that we spent entirely at sea which were quite lovely because the ship itself was so exciting to explore. From the observation deck we could look out at the open ocean and the passing coastlines while sipping a cocktail from the bar. We lounged by the pool and read some novels in between dips in the jacuzzi. In the atrium we enjoyed an acoustic guitarist playing renditions of Simon & Garfunkel while I beat John in Scrabble every single time. At the front of the ship, the Explorer’s Lounge was easily the most stunning area to spend our time. The mid-century furniture and floor-to-ceiling glass walls created the most comfortable atmosphere. All to say, this cruise was an absolute joy—it was really such a great experience. While I was on the cruise I found a sweet cookbook called The Kitchen Table in their gift shop featuring recipes from around the world that Viking visits. I came across this baklava recipe, which I devoured at every chance during our time in Greece, and I thought it would be special to share it with you. You can find the recipe at the end of this post. Trying new food is probably my favorite part about travelling, and it’s one of the strongest ways in which I connect to new cultures. That being said, the list of coffee shops, bars, bakeries, and restaurants we visited is ridiculously long, but I wanted to share some highlights from Athens, Santorini, and Rome should any of you find yourselves visiting sometime soon. Cafe Avissinia: This was such a cute cafe. The design was lovely, plus it is nestled right in the center of a vintage flea market which only added more character to this amazing spot. Plus, their freddo cappuccino is something you must try! Grande Bretagne Rooftop Bar: This rooftop bar was magical. It is located on the very top floor of an iconic Athenian hotel, which provided one of the most amazing views of the Acropolis! The food there can be a bit pricy, so if you just want to see Athens' ancient architecture shine at night, a simple cocktail at the bar is all you need to get. O Kostas Souvlaki: This was one of the most charming souvlaki places we encountered. It's a tiny hole-in-the-wall restaurant, and there's always a long line for the best of reasons, but it's totally worth it. Falafellas: If you are looking for a cheap and quick eat, this is the place! They serve flavorful falafel pitas that are so huge it was almost to big for me to finish. Don't worry, I made sure to eat it all. Melitini: This place was some of the best food we had in Greece—in fact some of the best food we've ever had. We actually had to stop ordering food here because our table wan't big enough, which is not too bad of a problem in my opinion. We had all of the greek staples here like tzatziki and greek salads, plus we had the most amazing fried potatoes covered in the best feta in the world. Pito Gyros: When in Santorini it's always great to have a quick and easy place to eat within arm's reach. So if you are looking for something other than a sit down meal, don't look any further. This place is the king of gyros and we've never had better. Kastro: This restaurant is all about the view. In Oia you will find a sea of restaurants that give you some of the best views in the city. This spot provided us with great food, great wine, and an unforgettable view. Panificio Panella: This cafe was heaven. After navigating through a bunch of touristy spots, this place was a breath of fresh air. Freshly baked pastries and flavorful espresso can be found in this cafe which also doubles as a general store of sorts. Pizzarium: I can't tell you how many people recommended this spot. John and I took quite the long walk to get here, but it was beyond worth it. I was told that their pizza topping options change almost every hour, or at least everyday, so there is always something new to try. Da Enzo: This restaurant is a little hidden gem, tucked away from any main streets or other touristy type of places. A line usually forms about 15 minutes before they open, so if you are going to go, I recommend getting there a little early if you want to eat right away. They serve a lot of classic Italian dishes, and based on what we ordered, it all tastes incredible. John actually said that he had the best carbonara of his life there, and after taking a bite I'd have to agree. Fatamorgana: The best gelato. This spot was recommended to me by Lily from Kale and Caramel, and Sherrie from With Food + Love, and man it did not disappoint. They have so many flavors to choose from, some of which are very traditional, while others are some of the most unique flavors I have ever heard of. John and I are so thankful for the incredible experience that Viking Cruises provided us with during our travels with them. This trip was kindly gifted to us and for that we will be forever thankful. This recipe for traditional baklava is from The Kitchen’s Table book which is kind of like the official Viking Cruise cookbook. I made this recipe with a few minor changes. I ended up using a 9x13 inch pan, but I’m thinking it might be best to use something smaller like an 8x8 inch square pan since my nut filling didn't stretch too far. The baklava itself was delicious, although I personally thought the amount of syrup used was a bit heavy for my taste but other than that it was great! Heat oven to 400°F (200°C), then over low heat gently melt the butter. Roughly chop the walnuts or pistachios (I used a mixture of both) then add to a bowl and toss with 1 tsp of cinnamon then set aside. Carefully unroll the phyllo dough. Make sure the layers are aligned, then either cut in half, or cut as needed to fit the size pan you are using. Cover the phyllo dough with a wet cloth to stop the layers from drying out. Brush the bottom and sides of the pan being used with melted butter, then place 2 sheets of pastry into the tin, brushing each thoroughly with butter. Repeat this process until you have 10 sheets layered. Sprinkle about 1/2 cup of the chopped nut mixture over the 10th layer of phyllo dough, then top with 3 more sheets of pastry and brush with butter between each sheet, then sprinkle with more nuts. Repeat this process until you run out of nuts. This should give you 5 layers of nuts, and 15 layers of phyllo. Once you’ve added the last 3 layers of phyllo, add an additional 3 sheets so that the final layer has 6 sheets of buttered phyllo (so 28 sheets total—10 to begin with, then 15 between nuts, then a final 3). *note, if using a 9x13 pan like I did, you may want to sprinkle a little more than 1/2 cup of nuts. If you take this route you'll just end up making less layers, so maybe 3 instead of 5 for example. Brush the top layer of phyllo dough with butter and using a very sharp knife cut the baklava into either squares or diamonds that are about 2 or 3 square inches in size. Make sure to not only take your time when cutting the baklava, but also be sure to cut all the way through so that the syrup coats everything when you add it after baking. Place in the oven and bake for about 30 minutes or until the baklava is golden and crisp. While the baklava is baking, prepare the syrup. Add the sugar and the water to a saucepan and bring to a boil without stirring for about two minutes, then add the cinnamon, honey, and orange zest. Reduce the heat, and let simmer for about 20 minutes. Remove the baklava from the oven and immediately drench with the syrup and sprinkle each slice with a few chopped pistachios. Cool completely before serving. I always like to make something special for Thanksgiving. Years ago, before I started the blog at all, I made an original apple pie recipe for a friends’ Thanksgiving we’d go to every year back when we lived in California. Once I started The Broken Bread, I made a graham cracker crust, marshmallow meringue pumpkin pie for Thanksgiving—and I still think it’s one of the tastiest things I’ve ever made. And now this year, John and I only have a few days between returning from a huge trip abroad and leaving yet again to visit family for the holidays, so I developed a recipe that’s delicious but quick. Cranberries, apples, and cardamom all tucked under brown butter streusel—how could it go wrong? I hope you all have a great Thanksgiving, and if any of you are looking for a dessert to bring to your family, I hope this cake will do the trick! To make the streusel, add the butter to a small saucepan or skillet and melt over medium heat. Once melted, continue cooking the butter until it appears medium-brown in color and has a nutty scent, about 4 minutes. Remove from heat and immediately transfer to a small bowl; let cool to room temperature. While the butter is cooling, in a medium bowl whisk together the flour, both sugars, cinnamon, and salt. Once combined, pour in the cooled browned butter and stir until combined. If you want to form a larger crumble, simple squeeze portions of the streusel in your palm and crumble with your fingertips until desired consistency is reached. To make the cake, set rack in center of oven, and heat oven to 350F°. Lightly butter the bottom and sides of the cake pan. In a medium bowl whisk together flour, cornmeal, baking powder, baking soda, and salt in a medium bowl and set aside. Add the sugar and orange zest to the bowl of a standing mixer. Rub the orange zest into the sugar until fragrant and slightly orange in color. Add the butter to the sugar and with a paddle attachment beat until light and fluffy, 3-4 minutes. Add in the eggs one at a time, making sure each one is fully incorporated before adding the next. Beat in the vanilla extract. With the mixer on the lowest speed, add the flour mixture and buttermilk in three additions beginning and ending with the flour. Once the flour has just combined, add the cranberries and the apples, and gently mix a few times to incorporate the fruit. Pour batter into the cake pan and top with streusel. Bake for 40-45 minutes, or until a toothpick inserted into the center comes out clean. Allow cake to cool in the pan for about 20 minutes, then release the sides of the pan and allow it to cool completely before serving. If you are using a traditional 9x2 cake pan, allow the cake to almost cool completely before removing. Once cool, loosen the sides, then place a flat plate or cutting board over the top and flip the pan to release the cake. Place another plate or cutting board on the bottom of the cake and flip back over. Aziz Ansari has a hilarious bit in his Madison Square Garden show from a couple years back where he plays on the fact that meat, as a general culinary category, just absolutely owns vegetables—no competition. He compares the two like different approaches to basketball: vegetables are like a child throwing up a weak underhand shot and missing the hoop entirely while meats are like an NBA star soaring into a slam dunk. And the joke’s not just funny because of Ansari’s crazy mannerisms and eccentric delivery, but because he’s just so right. Now accordingly, it would seem that a vegetable like cauliflower would inevitably bear the brunt of this joke—in fact, it’s literally Ansari’s first example. But perhaps not so fast. I’ve always thought that cauliflower’s plain flavor was meant to be more like a blank canvas than like a tasteless substance. And let me tell you: the work of art that this recipe brings out of this otherwise seemingly boring vegetable is certainly an exciting exception to Ansari’s poking fun. I decided to take a Mediterranean route, which happens to be just about my favorite kind of food in the world, and it simply took cauliflower to new heights. Once I tossed in olive oil, lemon, chili flakes, a crack of black pepper, and a load of cumin and coriander, I had a spicy, flavorful beginning to a piercing and aromatic dish. And then when I made a tzatziki-inspired, mint-laced yogurt sauce, this dish became something else entirely. It has distinctive spices, biting flavors, creamy textures, and an all-around delightful delivery. Meat had a become a mere equal at this point. This whole experience was only made better with with La Crema’s 2015 Monterey Chardonnay. It’s heavy on tropical fruit and citrus, which complements the dish’s savory flavors and rich acidity. It also ends with a buttery oakiness, which when done well in a chardonnay is really something to relish. So I urge you to put this dish to the test—can vegetables really measure up? Follow the recipe below to find out how big of a “yes” there is in store for you. Head over to La Crema's blog now to get the recipe for this plate of cauliflower goodness. About a week ago I made John and I this super simple peanut butter tart. After I received a few messages asking for the recipe, I'd thought why not share it. This is such a simple recipe, plus if find yourself craving a little something salty and sweet, this sweet little tart is just what you need. This isn't a crazy and exciting recipe, but man it sure does taste damn good. This tart is based of they ever popular peanut butter pie, but I made it to fit my personal taste, which means I covered it in a silky smooth chocolate ganache. Im my opinion, this tart has the perfect ratio of chocolate to peanut butter, making each bite pure bliss. In a medium bowl mix the ground graham crackers and melted butter together until combined. If the mixture feels a bit dry, go ahead and add one more tablespoon of melted butter. Pour the mixture into the tart pan and use your fingers to evenly press it along the base and up the sides of the pan. Make sure to press firmly along the inner creases as to make a little extra room for all that yummy filling. Place the pan on a baking sheet and bake until lightly browned and fragrant, 8-10 minutes; remove from oven and set aside. While the crust is baking, place the cream cheese and the peanut butter in the bowl of a standing mixer and beat on medium speed with the paddle attachment until smooth. Beat in the powdered sugar until fully combined. Using a spatula, add a little bit (about 1/4 cup) of the whipped cream to the peanut butter and mix it in to help lighten the filling. Once combined, add the remaining whipped cream and gently fold it in until just combined. Add the peanut butter filling into the graham cracker crust once it has cooled. Smooth out the top with a spatula; set aside. Add the chopped chocolate to a smallish bowl. Add 1/4 cup of heavy cream to a small saucepan and bring to a simmer. Once simmering, immediately remove from heat and pour over the chocolate. Add the cubes of butter and the vanilla extract, and let everything sit undisturbed for about 3-4 minutes so that the chocolate can slowly melt. Begin whisking the chocolate until a smooth and shiny ganache forms, then pour directly on top of the peanut butter filling. * If the chocolate doesn't fully melt, you can always set the bowl over a saucepan filled gently simmering water to help melt the rest of the chocolate. Just keep whisking until a smooth ganache forms. Use a spatula, or an offset spatula to smooth out the chocolate, then place the tart into the fridge for the ganache to firm up. Once firm, remove the tart from the pan, sprinkle with flaky sea salt, and enjoy! It feels as though fall has immediately come to Seattle in full force. Evergreen trees have taken on shades of maroon and orange in the course of mere days, and the climate is diving at a rapid rate. Hard to think of a better excuse to similarly dive right into the comfort food this season is so well known for. And while heavy comfort food is coming later next month for Thanksgiving, this stuffed sweet potato is more like a transitionary dish instead of full comfort—it embraces the season but in a lighter, brighter mode. These chanterelles are truly special mushrooms. These uniquely shaped, golden-hued gems have been available at my local farmer’s market, and in my mind seemed to be the perfect candidate to saute and stuff into a baked sweet potato. I combined them with butter, leeks, and fresh thyme, which really produces a wonderful result. And once stuffed into a sweet potato and garnished with crumbled goat cheese, it all suddenly becomes a flavorful, full-fledged meal. Be sure to head over to La Crema’s blog to get the full recipe. Now I ended up loving this stuffed chanterelle sweet potato so much that I thought it would be fun to create a meat-focused version as well. Chorizo was my protein of choice, with a little added chard to cut through the saltiness of the meat—plus it’s always nice to add a little extra green into the mix. This is a great version of the dish to make if you are short on time and really like meals that mix sweetness and saltiness in an interesting way. I went with La Crema’s 2015 Monterey Pinot Noir as the perfect wine pairing for this dish, since it complements all the components so well. It’s spicy, earthy, oaky, and fruity, and with each sip it just gets better and better. Heat oven to 400°F. Line a baking sheet with parchment paper or foil. Pierce each potato several times with a fork then place on the prepared baking sheet. Bake the potatoes until tender, this can take anywhere from 45 min to 1 hr. Remove baking sheet from oven and set aside. Add the chorizo to a large skillet set over medium heat and cook until meat is fully cooked through. Add the chard and cook for about 1 minute, then remove the pan from heat. The residual heat from the meat and pan will continue to wilt the chard, so just keep stirring a few times until the chard has wilted. Slice each potato lengthwise and use a fork to fluff up the flesh. Divide the chorizo amongst the sweet potatoes and garnish with a little bit of sour cream. Enjoy right away! My sweet husband John has real soft spot for pumpkin bread, so as a little surprise I made a cake version of his favorite fall-time treat. John's mother has been making him pumpkin bread every year for long as he can remember, and whether he was living at home or in another city, his sweet mother would still make sure that her son got his pumpkin bread. Since we currently live in a different state than John's parents it's been less likely that he gets his pumpkin bread fix, so I thought I could help fill the void with this cake. This is a very traditional pumpkin cake, one filled with just the right amount of spices. The one unique aspect that you may find is that I call for pumpkin seed oil in this recipe. This is a relatively new type of oil to me, but I liked using it in this cake because of it's deep nutty flavor which is detectable in each bite. The flavor is prominent, so if you don't want to commit to adding this type of oil you can either use half pumpkin seed and half vegetable oil so that you get some of that nutty flavor. Or, you can omit the pumpkin seed oil all together and use all vegetable oil—the choice is yours. This cake is fragrant and moist, and even though it isn't his mother’s recipe, John couldn't help but smile a first bite. It's times like these that I remember how powerful food can be—I love how it can connect us. For even though John surely longs for some of his mother’s pumpkin bread, at least a slice of my cake can bring him a little bit of love by transforming an old memory into a present reality. Begin by preheating your oven to 350°F. Lightly grease the cake pan with a bit of butter, or with some non-stick spray; set aside. In the medium bowl whisk together both flours, baking soda, baking powder, salt, pumpkin pie spice, nutmeg, allspice, ginger; set aside. In a large bowl add both sugars and the peptia oil, and whisk together until smooth. Add the eggs one at a time, whisking after each addition. Whisk in the pumpkin puree and vanilla until combined. Add the dry ingredients to the wet, mixing with a spatula or spoon until all the flour has been incorporated. Pour the batter into the cake pan and bake for 30-35 minutes, or until a cake tester inserted into the center comes out clean. Allow the cake to cool for about 15 minutes before removing. Place the cake on a rack to cool completely. Serve each slice with quartered figs, pecans, a dollop of whipped cream, and a bit of fresh orange zest.